Upvas Aloo Kachori is a fasting snack. Upvas Aloo Kachori is made during fast or upvas. Upvas Aloo Kachori is made with potatoes and stuff with coconut and peanut. Upvas Aloo Kachori tastes really delicious and one of the popular upvas dish in Maharashtra. 1. Take all chutney ingredients. 2. Add ¼ cup water (add extra water if needed) in it and blend in blender or mixer to make smooth chutney and keep aside. 1. Boil the potatoes and mash or grate them in bowl. 2. Add arrowroot, salt and cumin powder into the mashed potatoes; knead into firm dough and keep aside. 1. Heat ghee in the pan; add cumin seeds, chopped green chilies then add grated coconut and sauté for few seconds. Add crushed peanuts and sauté again. 2. Add sugar, salt and mix well to make the filling mixture. 1. Take a small portion of the dough and press it between palms to make a small puri, stuff with coconut mixture and form into a ball. 2. Repeat step 1 for rest of the dough and the filling. 3. Now deep fry all balls in the hot oil till golden brown in color. 4. Serve hot Upvas Aloo Kachori with chutney. Add ¼ cup water (add extra water if needed) in it and blend in blender or mixer to make smooth chutney and keep aside. Boil the potatoes and mash or grate them in bowl. Add arrowroot, salt and cumin powder into the mashed potatoes; knead into firm dough and keep aside. Heat ghee in the pan; add cumin seeds, chopped green chilies then add grated coconut and sauté for few seconds. Add crushed peanuts and sauté again. Add sugar, salt and mix well to make the filling mixture. Take a small portion of the dough and press it between palms to make a small puri, stuff with coconut mixture and form into a ball. Repeat step 1 for rest of the dough and the filling. Now deep fry all balls in the hot oil till golden brown in color. 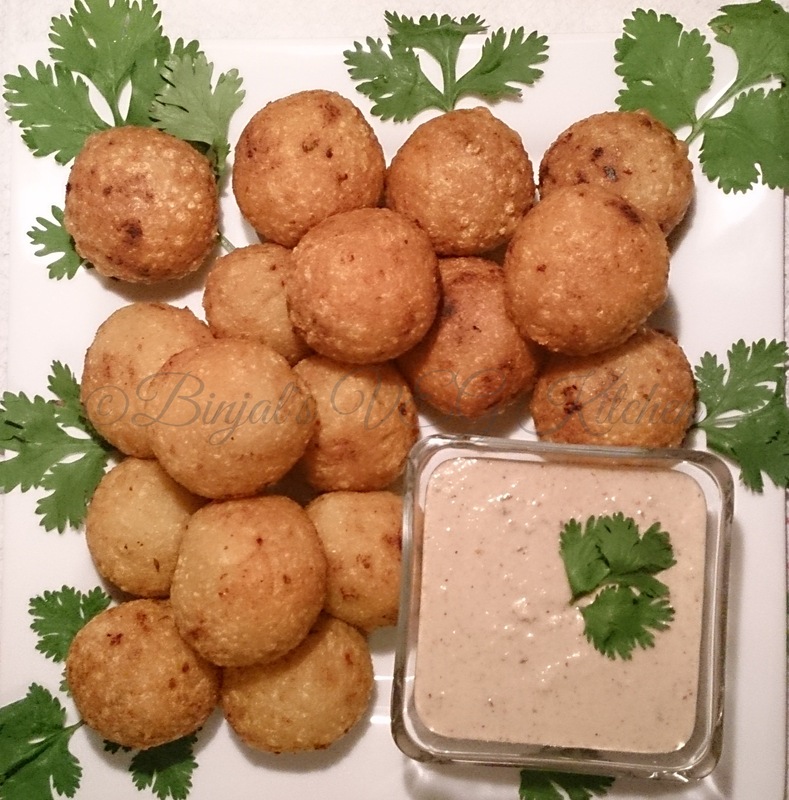 Serve hot Upvas Aloo Kachori with chutney.